We provide light, medium, and heavy-duty towing along with roadside assistance and accident recovery services. We also have the equipment necessary to perform the majority of equipment transport jobs in both local and long-distance situations. Our fleet is comprised of state-of-the-art trucks ranging from light and heavy-duty wreckers to heavy-duty tandem flatbeds. Our drivers and operators are not just licensed and certified—they know how to provide top-quality customer service, making each of our clients feel safe and comfortable knowing their equipment is in good hands. We believe in establishing a one-on-one connection with our clients, earning their business for life by doing the best job possible in a friendly and efficient manner. 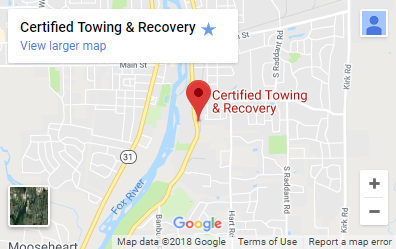 Simply put, we’re not happy unless you’re happy, and we guarantee that we will prioritize our clients’ interests in any towing or transport situation.